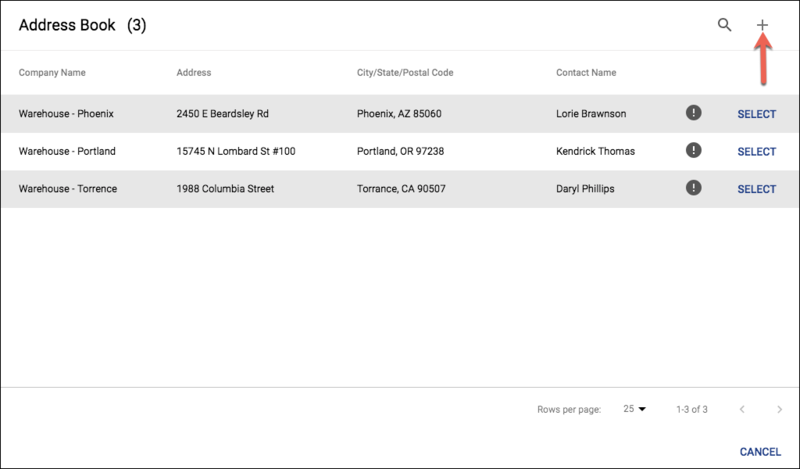 Store addresses within the Address Book for faster quote creation! Click your Profile Icon (located in the top right corner of Emerge). The Address Book will display all addresses saved within your profile. You are able to search and add more addresses. 2a. While creating a quote, you can click the Address Book icon shown below. This will show all addresses currently saved in the Address Book. address without leaving the screen. No matter where you are, clicking the 'plus' (+) sign will prompt the Add Location screen to appear. 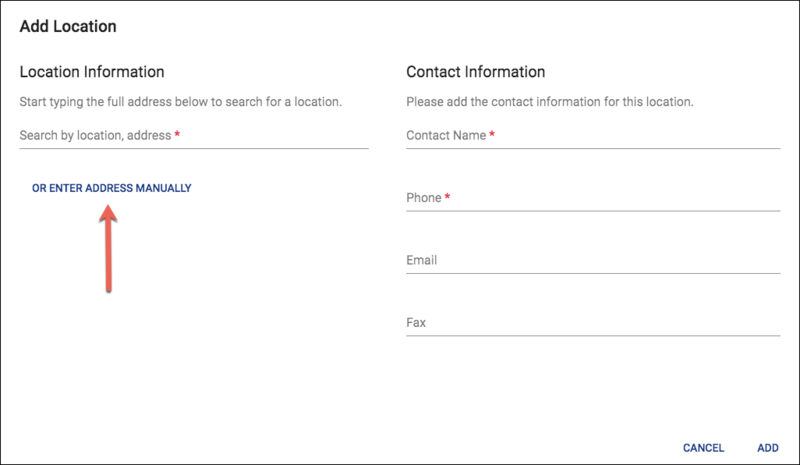 Here, you can simply search the location using our typeahead feature or you can click ENTER ADDRESS MANUALLY, which will prompt you to add all location fields. Please note: Every address enter requires Contact Information to be entered as well. Finding and using saved addresses when creating quotes is super simple! Just start typing out an address that is within your address book and select it from the drop down below. Users who utilize our LTL Connect feature will need to know the difference of a Location and My Office Location. 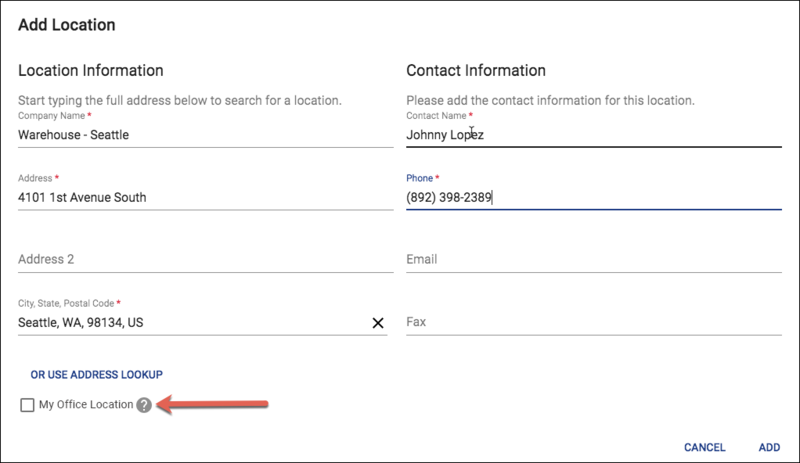 Within the address book, users can now mark addresses as My Office Location to ensure accurate rates when running LTL quote. Location: Any address entered into the Address Book will be considered a Location. All Locations will be available for use when creating an FTL/VPTL or LTL quote(s). My Office Location: Any address entered into the Address Book can be marked as My Office Location. My Office Locations are typically physical addresses that are used for inbound or outbound shipments. These locations will be directly associated with an LTL Connection. When creating LTL quotes, after selecting Your Role (Shipper, Consignee, or Third-Party), My Office Locations will be available to select from. This will ensure accurate rates are being shown for each LTL Connection. Users can add multiple addresses quickly and efficiently to their Address Book using the Bulk Upload feature! Click the initials logo in the top right corner, then Address Book. Click on the Bulk Upload Locations icon. Download the template by clicking on the Download Template selection. Enter all details that are required in the downloaded template. Users can upload the template using Method 1 or Method 2. Now your addresses will be available for you to select for your next quote!